Martin Jordan helps create services that people value. He is a civil servant and works as Head of Service Design at the Government Digital Service1, part of the UK’s Cabinet Office. Besides, he co-organises the Gov Design Meetup2 and serves as editor of The Service Gazette3. Martin teaches, talks4 and writes5 about the intersection of service design, transformation and value creation. 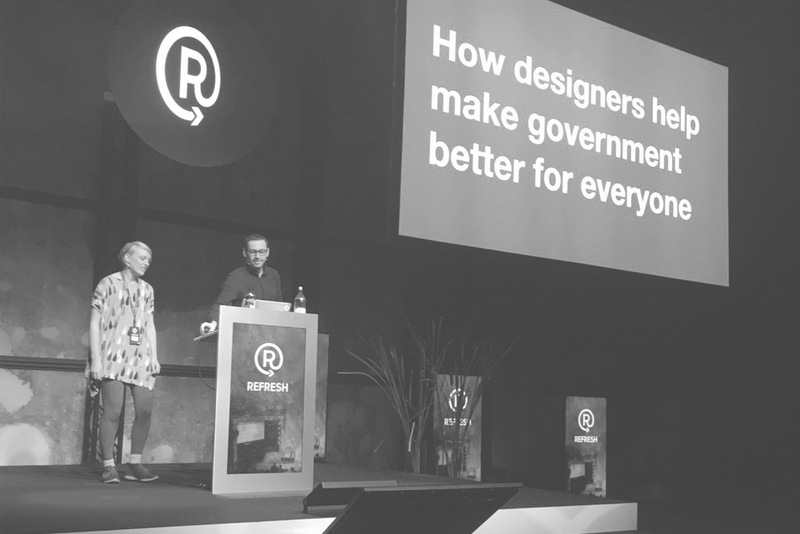 How can designers help make government better for everyone? This talk is about how the UK’s Government Digital Service is helping to redesign government around user needs, and how we brought agile working and multidisciplinary teams to government. And bunting. And stickers. Versions of this talk were held at Refresh conference in Tallinn, Estonia, at UX Camp Europe in Berlin, Germany and at the University of Bristol, England. Data is impacting people’s lives whether we want it to or not. With most services today being partly or exclusively digital, data is collected, stored and used in enormous quantities. A key role of the designer is to be an advocate for the user and act on their behalf when designing the service. This includes asking questions like: what data is my service collecting? How and when is this data being used? Who has access to this data and who owns it? This talk was given at Service Lab London and Service Experience Camp in Berlin, Germany. At Government Digital Service, Martin leads the service design community across the UK government. In close collaboration with the other heads of design, he shapes what service design is in government and how it is done. He builds a strong cross-departmental service design community and helps increase government’s service design capability through recruitment, training and mentoring. In addition to that, he works with departmental teams on specific end-to-end services. As part of a multidisciplinary working group, he co-defines what good service design looks like and how to measure the success of a service. Goverments worldwide start to recognise design as a powerful way to change the way they interact with citizens. This bimonthly London meetup connects designers working in, for or with government. The goal is to exchange knowledge, share experiences and support each other. ‘Public Service Lab’ helps German government to adopt a user-centred approach to designing its services and organisations. It does so by organising learning events for public servants, running workshops, and publishing articles about good practises in German. The first interactive conference took place in October 2017 at Impact Hub Berlin. ‘Service Design Berlin’ shows what good service design looks like and how it’s done. It is a local community with a global reach. The goal is to bring people with a service-oriented mindset together and provide a platform for sharing experiences, exploring new tools and expanding knowledge. The ‘Service Experience Camp’ is an interactive co-conference taking place in Berlin since 2013, bringing together 250+ service innovators from all over Europe for thought-provoking talks, hands-on workshops and discussion panels. The next edition is planned for November 2018. ‘Talk Service’ is a podcast series currently in development. Each season covers a specific service area – like designing for journeys, wellbeing or home. Every episode is about 30 minutes long and covers one expert interview linked to the larger theme. ‘Talk Service’ will finally launch in spring 2018. ‘The Service Gazette’ is an annual print publication for service innovators. Its first issue discussed the topic ‘struggling for change’ as it was released at the Service Experience Camp 2015 debating the same subject. The second issue on ‘Design for Impact’ was published in November 2016. Its 2017 edition discussed public service design. Jobs-to-be-Done as framework is applied by innovation consultants for a few years by now. Yet only recently it started gaining broader momentum and finds adaption in areas of design. After applying various Jobs-to-be-Done tools at Nokia since 2013, we are able to integrate them with and thereby improve and extend our familiar service design methods. Jobs-to-be-Done (JTBD) is primarily a practitioner’s approach. The framework provides a clear language that helps to uncover and articulate implicit facts. It makes those explicit and actionable throughout the service design and development process. Customers hire services and products to do a certain job. Once people spot a job in their life they start looking for a solution, an offering that helps them to get the job done. Which offering they eventually hire often depends on the circumstances in which the job occurs. This article highlights the importance of customers’ situations and contexts when creating new offerings. As circumstances are changing, people’s related needs and desired outcomes do too. Using the example of Berlin’s urban mobility services, the text illustrates how all offerings fulfil the general need of getting from A to B, but also which specific situations each service caters for. Needs determine which products and services people are using. While offerings evolve and advance over time, needs remain unchanged. For service creators it is key to uncover and address basic human needs to create successful offerings. The more a service is satisfying one or more needs, the more likely it is used, re-used and recommended to others. The article discusses the concept of basic human needs, developed by the Chilean economist Manfred Max-Neef in the context of service innovation. In contrast to the popular, but unproven needs pyramid by Abraham Maslow, Max-Neef describes needs as simultaneous and complementary instead of hierarchical. The text gives an introduction of how to develop offerings that incorporate various satisfiers to fundamental human needs. Service design is still a rather young discipline. As it matures, it evolves, diversifies and expands. In this article, we propose one possible direction this expansion can take: the integration of service design and brand communication. Looking closely, the two approaches are similar in many ways. For example, both have a strong user orientation and both contribute to business value. Yet they differ strongly in the way they act upon the user: influencing actions versus influencing perceptions. Integrating the two perspectives might not only create a new field for both service designers and marketers, but might also create value for users and businesses at the same time. The use of qualitative and quantitative research in service design: Service design practitioners seem to agree on the fact that research is important. There seems to be bias against quantitative research and a preconception to favouring qualitative research methods in the service design context. But only scant evidence and information on how research is actually embedded in the design process and which methods – qualitative and quantitative – are being used, is available. This article aims to shed light into the ‘research black box’ of service design by offering a current analysis of how research methods are used in this field. Successful services are rarely the result of a spark of genius. Before a service reaches its final state, it undergoes various iteration cycles. The iterations are often achieved through prototyping. Rough-and-ready prototyping minimises development costs. Moreover, prototypes can identify problems at an early stage and help to continuously redefine concepts. This article looks at different dimensions of prototyping and suggests that prototyping is valuable beyond just communicating an idea. It gives an overview of prototyping methods for the service design field and analyses their strengths and weaknesses. Martin is currently based in London, Great Britain. Previously he worked for Nokia in Berlin, Germany and for FutureBrand in Buenos Aires, Argentina. You can find his latest thoughts on Twitter or get in touch via e-mail.